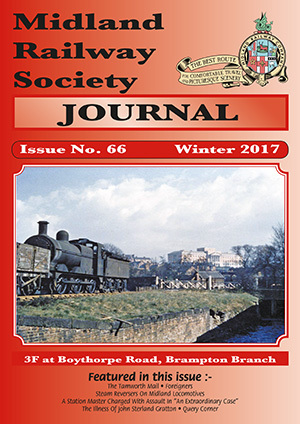 Front Cover: Our cover picture is a foretaste to Dave Hunt’s article on the Midland’s early locomotive stock, including those inherited from the constituent companies and from those taken over early in its history. 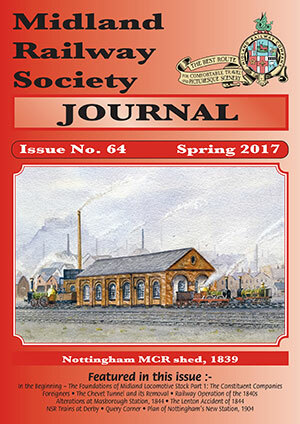 Denys Brindley’s painting was commissioned by Jim Perkins, co-author of the three-volume series The Midland Railway in Nottingham, and shows the MCR engine house at Nottingham in 1839. Bury 2–2–0 Tiger is seen at the left of the engine house whilst, on the right, are depicted 0–4–2 Fox built by Jones,Turner & Evans, which was originally a contractor’s engine used during the line’s construction and later bought by the MCR, and the Butterley Co.’s. 2–2–2 Hercules. All three had been withdrawn by 1847. Back Cover: In an attempt to keep to our general theme of 'Early Midland' our back cover reproduces the earliest Midland Railway advertisement of services that I have been able to find. The trip was to London on 22nd July 1844 with a return either on the 27th or two days later. It was printed in The Bradford Observer; and Halifax, Huddersfield, and Keighley Reporter of Thursday, 11th July 1844. 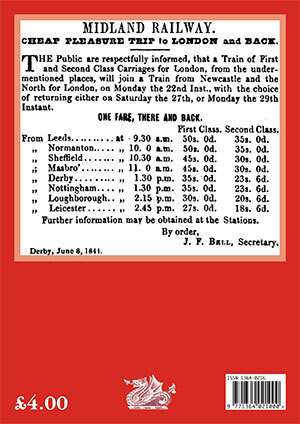 This Midland excursion was just two months or so after the formation of the Midland Railway on 10th May 1844 by the merger of the three constituents, the North Midland, the Midland Counties and the Birmingham and Derby Junction Railways. Note the absence of third class and the expensive fares compared with, say, an ordinary workman’s weekly wage. Despite the apparent misprint on the bottom line the date at which the advertisement was issued from Mr. Bell’s office was 8th June 1844, the print of the second '4' being rather light and most of it then disappearing during the scan from the newspaper. 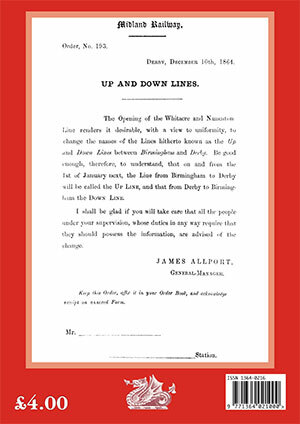 The Midland Railway Servants’ Refreshment Co. Ltd.
A Station Master Charged With Assault In "An Extraordinary Case"
Back Cover: The Midland Railway published a number of guide books aimed at the wealthier of its potential passengers. These covered the especially picturesque regions traversed by the company’s trains and included Derbyshire, Northern Ireland, the Isle of Man and, of course, the spectacular route to Scotland. Several publications of this type were directed at the American market, and others to tourists from France. One of these was a guide book to the Midland Railway printed in French (Chemin de Fer Midland de l’Angleterre). 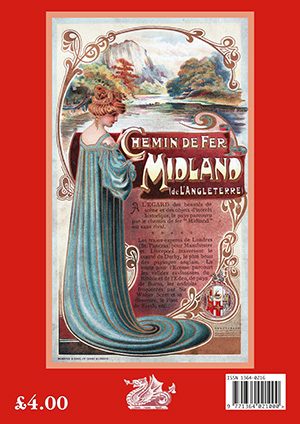 The book of 80 pages plus a map was printed by Bemrose (the Midland’s printers) in 1900 and had coloured pictorial covers of which this is the front. 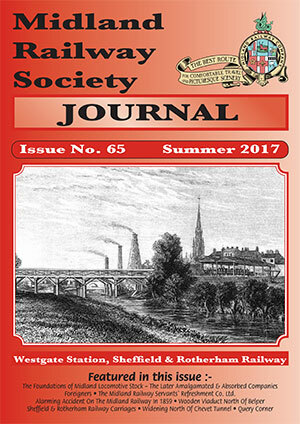 Translation: With regard to scenic beauty and objects of historical interest, the countryside traversed by the Midland Railway is without rival. The express trains from London St. Pancras for Manchester and Liverpool cross the county of Derby (sic), the most beautiful countryside in England. The Scottish route crosses the ravishing valleys of the Ribble and the Eden, |Burns country, the places frequented by Sir Walter Scott as well as his country house, the Forth Bridge etc. This brochure with a date of 1900 was undoubtedly produced for the Paris Exposition of the same year, when the Midland’s Princess of Wales won the gold medal. It would have been aimed at the French tourists whom the Midland wanted to attract along their route to Scotland. The characteristic ‘Art Nouveau’ style bursts out of this attractive picture, with its flowing organic lines and references to natural forms and forces. The young lady has a dress that seems to flow into the bottom of the picture with the suggestion of a pool. It manages at once to suggest that you can travel at high speed in drawing-room comfort while at the same time partaking somehow in what is going on outside. The fact that she is placing a letter seems to emphasise this. The picture of the crag at the top is fairly generic, but does seem to suggest one of the limestone dales in Derbyshire. So all in all, a very clever amalgam of a number of things very much designed to attract the discerning tourist. The printer, Bemrose, was a good choice for the task. This old family firm had grown up in Derby since it started printing timetables in 1846, and William Bemrose who was in charge at this point was an Art specialist, having written the first thorough book on woodcarving which went into twenty editions as well as tomes on porcelain and pottery. He travelled widely and this may explain possible use of a French artist here, although there is no signature so that is just a guess. Bemrose and the Midland ‘grew up’ together in Derby’s heyday and the directors would have undoubtedly mixed in the same social circles, to the mutual benefit of both companies. Although now closed, the firm lasted until 2010.